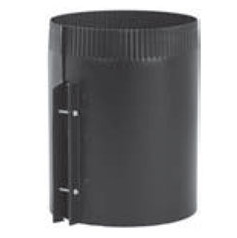 This Snap-Lock draw band is designed to connect your stovepiping to flue collars even if the collars are a little larger in diameter than your stovepipe's opening. With this connector, you can create an easy connection between your flue and your piping, and you will only need 18 inches of clearance from the nearest combustibles. The black finish allows this to blend in with most vent systems, and the 6 inch diameter makes this a perfect fit for most vents. Do you make this same thing in 8"? The 8" version of this item can be found here. my wood burning stove has a pipe that is about 6.25" and my pipe in my wall is 6" even. i need a connector piece for them. thanks. There is no connector piece made to decrease from 6.25" to 6"
What is the length of this draw band? Per the manufacturer, this item is 8 inches in height/length. Can these bands be used on 6 in steel tubing that I am using for stove pipe? Yes, this draw band can be used for a variety of venting applications. Will this item work with non-Snap Lock pipe? While this band is manufactured for use with Snap Lock piping, it can be used with almost any 6-inch diameter crimped stovepipe. This includes other brands such as Imperial and Heat-Fab. ..........to fit the sauna stove pipe. I ordered this due to not being able to fit a regular piece of 6" pipe on my stove thimble. This worked great and sealed up tight with not smoke. Without this piece, I could not connect to my other piping. This was crucial to my fireplace. It worked! We have been using the fireplace ever since.